Other than the previously mentioned fried dried fish skins and possibly jerky there are few more appealing beer snacks. What if your pork crackling resembled a pigs face? How would you feel about cutting into it and nomming on it then? 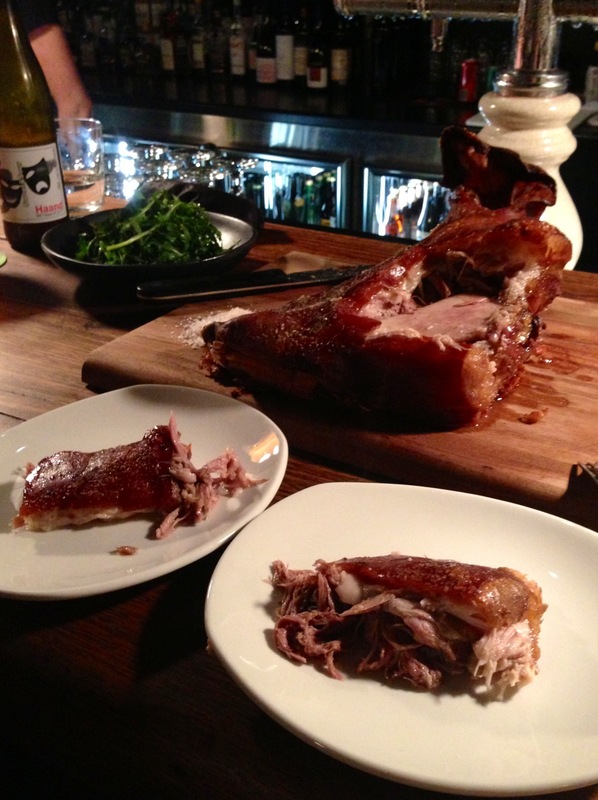 Luckily for me, I don’t suffer from the common “I can’t eat it if it has a face” dilemma so when a friend recommended I try the roasted 1/2 pigs head at Josie Bones in Smith Street Collingwood I jumped at the chance! For the unacquainted Josie Bones is known for its approach to cooking the whole animal and using beer when appropriate to cook. They also stock a ridiculously large menu of local and imported beers and are willing to recommend according to your taste. As any large piece of meat should, it takes a while for a pig’s head to come out of the kitchen, so naturally it made sense to order a couple of the “bites” items off the menu beforehand and a couple of beers. Oysters natural, Quail Egg and Leek and Bone Marrow croquettes. Other than the oysters being incredibly fresh the other two dishes were nice but not outstanding. It left us wanting more. You ask and you shall receive! 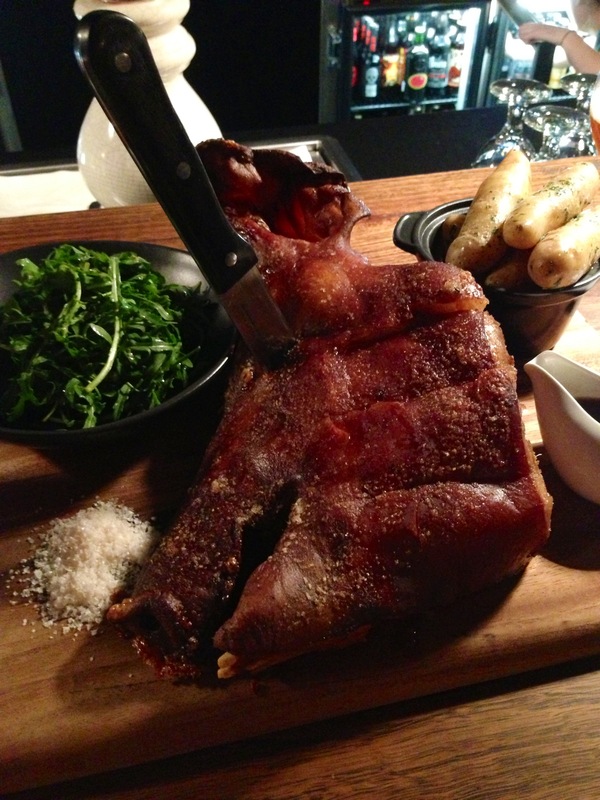 When the pig’s head arrived we almost regretted ordering entrees as… it’s a beast! 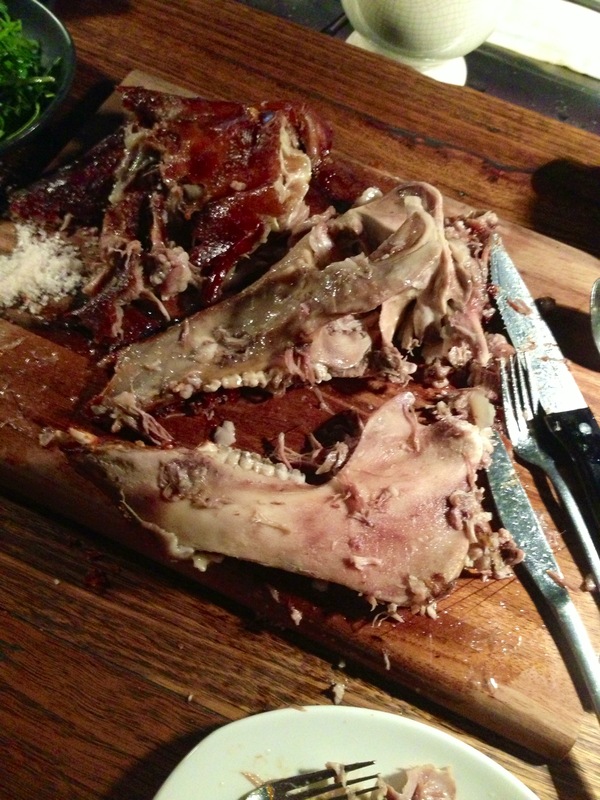 Seriously a pig’s head is really quite a thing to behold in real life, well… roasted life. The ear, the huge jaw complete with teeth, the snout and the delicious looking cheek that you could just tell would hold such juicy meat, it was very exciting and a little overwhelming deciding where to begin! We started on the cheek, the skin gave way under the sharp knife with a satisfying crack and pop and the meat complete with crunchy skin atop lifted away from the bone with little effort. It was served with a jus (well I think it was a jus!) which cut through the very salty flavour very nicely and let’s just say that cheek was demolished in a time that would be the envy of most competition eaters! The Kipfler potatoes on the side and seasoned rocket were mostly ignored amongst the mountain of pork, however it was nice to munch on something else to break the flavour up at points. 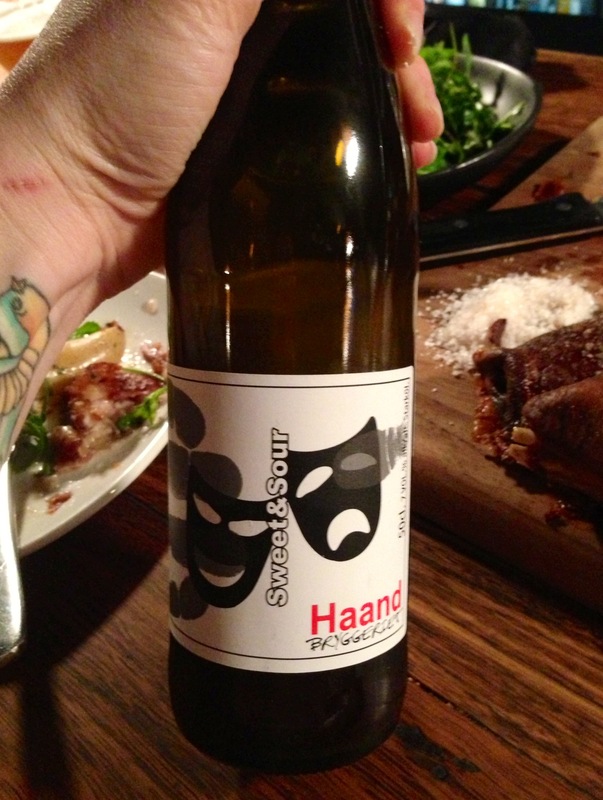 We were recommended to try a certain beer with the pork, a sweet and sour beer called HaandBryggeriet. Whilst I understand the concept of the sweet and sour matching well with the pork, it didn’t quite do it for me. It’s a VERY strong-tasting beer that leaves a rather strong aftertaste which coupled with salty pork has more flavour overload than an original sour warhead. A pint of apple cider however… magic! It really is surprising how much meat is on a head, other than the obvious cheek and snout it was surprising that around the eye socket and forehead held quite a bit of flesh, all with varying strengths of pork taste and all covered in more crackling than you can poke a stick at… no we didn’t eat all the crackling, I’m pretty sure if we did I’d be writing this from a cardiac arrest ward. All in all between two people we ate the majority of the meat and I would say if you wanted a hearty meal for two with no entree this would suit most people. OR as the waitress suggested it would be an amazing thing for a larger party to order and share. One thing I really liked about the place was the fact that we did not feel rushed to leave. I’ve been to so many Melbourne restaurants that are happy to serve you dinner, get your drinks and the bill then rush you out of there to seat the next group. Whilst I understand it’s in the nature of the business, it’s nice to sit back after such a meal with another drink and not feel pressured to exit the building.